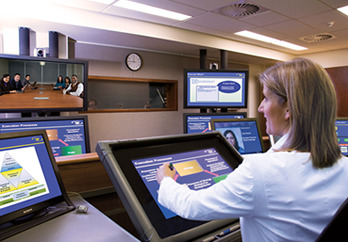 Smith School of Business began experimenting with videoconference in the early 90’s as a means of creating a live, interactive learning experience in cities across Canada. In 1994, the National Executive MBA program was launched, with professors teaching from a broadcast studio at Smith School of Business, Queen’s University and student teams in several Canadian cities. Since that time, the School has continued to improve both the technology and the teaching techniques to the point where many of our students find the experience to be seamless and, in many ways, superior to a traditional classroom. In 2005, Queen’s formed a partnership with Cornell University, the largest of the U.S. Ivy League schools, to launch the Executive MBA Americas program using the same technology. There are two state-of–the-art broadcast studios at Smith School of Business and one at Cornell.